Bahay ng Marino is a budget hostel situated in Manila Bay - South Harbor in the port area. With its ideal location, the property offers accessibility to Manila's tourist attractions such as Rizal Park, Intramuros, Museo Pambata, Nayong Pilipino, Roxa... Bahay ng Marino is a budget hostel situated in Manila Bay - South Harbor in the port area. With its ideal location, the property offers accessibility to Manila's tourist attractions such as Rizal Park, Intramuros, Museo Pambata, Nayong Pilipino, Roxas Boulevard, Quirino Grandstand, Manila Ocean Park and even some well-known universities in the metro. Advertising itself as the "hippiest hostel in Makati," Urban Hostel Makati takes you to the busy streets of Manila's financial district where you are exposed to everything that Makati has to offer in terms of entertainment, dining, and shopping choic... Advertising itself as the "hippiest hostel in Makati," Urban Hostel Makati takes you to the busy streets of Manila's financial district where you are exposed to everything that Makati has to offer in terms of entertainment, dining, and shopping choices. Urban Hostel Makati can be found at 5059 P. Burgos Street in Poblacion. It is just a few steps away from convenience stores, banks and ATM machines, and a selection of restaurants and fast food chains. Business travelers can benefit from its location within Makati Central Business District while leisure travelers can enjoy its short distance from the lifestyle district of Century City. From the accommodation, it only takes an 8-kilometer drive to reach Ninoy Aquino International Airport. Urban Hostel Makati's bright and cozy rooms serve as your temporary abode in Makati City. 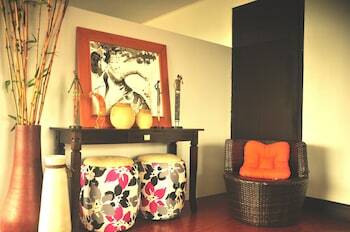 Each of the rooms feature colorful and well-furnished interiors filled with tasteful decorative accents. The six fully air conditioned rooms come with free WiFi access and a private bathroom equipped with a toilet, shower, and bath essentials. 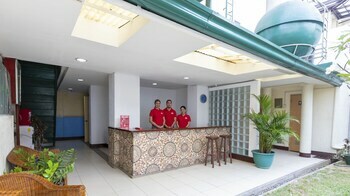 While staying at Urban Hostel Makati, you can avail housekeeping services, airport transfers, and tour assistance. You're also given access to the car park, a shared kitchen, and the free WiFi provided in common areas. Safety deposit boxes are available at the front desk for your valuables. 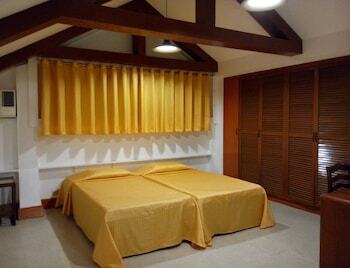 Bunks Makati is a budget hostel located in Olympia Village, Makati City. Its ideal location offers accessibility to numerous bar and restaurants, shopping malls and the Makati Central Business District. 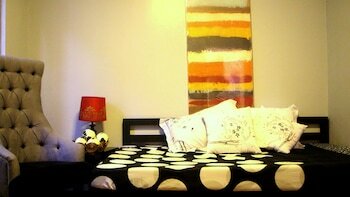 The property caters mostly to backpackers wi... Bunks Makati is a budget hostel located in Olympia Village, Makati City. Its ideal location offers accessibility to numerous bar and restaurants, shopping malls and the Makati Central Business District. Offering comfortable rooms and excellent services, Halina Hotel Sta. Mesa is ideal for that much-needed rest and relaxation, without having to leave the Metro. Located along Valenzuela Street in Sta. Mesa, Manila, Halina Hotel is a 3-minute drive ... Offering comfortable rooms and excellent services, Halina Hotel Sta. Mesa is ideal for that much-needed rest and relaxation, without having to leave the Metro. Located along Valenzuela Street in Sta. Mesa, Manila, Halina Hotel is a 3-minute drive from SM Centerpoint Sta. Mesa and about 10 kilometers away from the Ninoy Aquino International Airport. The hotel is accessible by taxi and other modes of regular public transportation. Guests coming in via private cars can use the parking spaces onsite. Halina Hotel features a 24-hour front desk manned by well-trained staff that is more than willing to help you with your needs during your stay. The hotel also offers complimentary WiFi access to its guests as well as 24-hour room service. The rooms in Halina Hotel have full air conditioning and cable TVs . In addition, they each have a private toilet and bathroom, a hot and cold shower, and hair dryer. Toiletries are also provided. Sta. Mesa is the easternmost district of Manila, located near the cities of San Juan, Mandaluyong, and Quezon City. The capital city of the Philippines, Manila is home to various historic sites such as the Fort Santiago, Intramuros, Rizal Park, and the National Museum. The cities of San Juan, Mandaluyong, and Quezon City are important business centers in the Philippines. Makati, the country's premiere financial and business district, is also easily accessible from Santa Mesa. Earn as much as 45 points. Treat yourself to a staycation to escape the daily grind of the metro. Providing you with a respite in Quezon City, Harts Hotel offers you great service and a variety of facilities for a pleasant stay. Harts Hotel can be found along Corregidor Stree... Treat yourself to a staycation to escape the daily grind of the metro. Providing you with a respite in Quezon City, Harts Hotel offers you great service and a variety of facilities for a pleasant stay. Harts Hotel can be found along Corregidor Street in Project 7. This hotel offers budget-friendly accommodations that come with breakfasts for both staycationers and businessmen in Quezon City. It is within walking distance from SM City North EDSA and Trinoma, the leading shopping malls in the area. LRT Roosevelt Station is also accessible which you can use to get around the nearby cities. Government offices are a short jeepney ride away, and the hotel is also equipped with parking spaces for private vehicles. Ninoy Aquino International Airport is less 17 kilometers away. Make yourself at home at Harts Hotel's creatively-designed guestrooms. All rooms are fully air conditioned and come with a TV, WiFi internet, hair dryer, and an en suite toilet and bath with hot and cold shower and bidet. Towels, toiletries, and slippers are already provided for. Harts Hotel has an array of facilities that will suit the needs of both leisure and business travelers. Its public areas are equipped with free WiFi access so you can stay connected online. You'll also find a spa that offers a variety of massages and treatments. Other services include transportation services, laundry, room service, and wake-up calls. Situated along Limbo Street, Dormitels is one of the most affordable accommodations in The Fort, Taguig area. Our budget hotel is a stone throw’s away from Kalayaan Avenue, meaning you can easily reach Bonifacio Global Center and Makati CBD, which ar... Situated along Limbo Street, Dormitels is one of the most affordable accommodations in The Fort, Taguig area. Our budget hotel is a stone throw’s away from Kalayaan Avenue, meaning you can easily reach Bonifacio Global Center and Makati CBD, which are home to a range of restaurants, shopping centers, and trendiest hangouts and spots in the metro. From our name itself, you can easily tell that we showcase a unique dormitory-slash-hotel concept. Indeed, our rooms offer the perfect mix of simple, yet functional dormitory living and the convenience that comes with a hotel service. Our rooms are furbished with a comfy single or double bed, a private bathroom, a choice between a fan or an AC unit, and a flat-screen TV. We also feature a 24-hour front desk, as well as colorful, artistic murals that you will see inside and outside of our budget hotel. Art deco architecture, "Old Manila" interiors, modern amenities, and friendly staff: experience all these and more at Pension Natividad. Set right in the heart of one of Manila's significant districts, Pension Natividad is right along MH del Pilar S... Art deco architecture, "Old Manila" interiors, modern amenities, and friendly staff: experience all these and more at Pension Natividad. Set right in the heart of one of Manila's significant districts, Pension Natividad is right along MH del Pilar Street in Malate. This charming guesthouse is 10 minutes away from Malate Church on foot. Likewise, the Baywalk is also within walking distance and is the perfect spot to catch the majestic sun as it rises and sets over the country's capital city. Pension Natividad is a family-run guesthouse so you can be sure that the services are on point, making you feel more at home and at ease. Featuring a 24-hour front desk and a garden, Pension Natividad provides the ideal setting for tourists and business travelers who want to make the most out of their stay in the city. With the establishment's modern features like the complimentary WiFi services, all types of guests will enjoy a comfortable and pleasing stay. A total of 43 spacious rooms are available at Pension Natividad, with minimalist designs to ensure that anyone can have a relaxing stay. Each room is equipped with either an air conditioner or fan and comfortable beds. Stay Malate can provide accommodations for solo or group travelers, whether on short-stay or long-term stay. Guests can choose from a range of accommodations to allow for flexibility in preference and budget. Guests can choose from either private or ... Stay Malate can provide accommodations for solo or group travelers, whether on short-stay or long-term stay. Guests can choose from a range of accommodations to allow for flexibility in preference and budget. Guests can choose from either private or shared rooms, and fan rooms or air-conditioned rooms. Dormitory rooms are also available, with shared bathrooms and toilets. Some rooms have a private bathroom with shower and a balcony with view. All rooms are accessible by stairs and elevator. With a stay at ZEN Rooms Basic 10th Ave Cubao in Quezon City, you'll be within the vicinity of SM North EDSA and Fort Bonifacio. This hotel is within the vicinity of Venice Grand Canal Mall and Rizal Park. Make yourself at home in one of the 27 air-conditioned guestrooms. Complimentary wireless Internet access is available to keep you connected. Bathrooms have showers and complimentary toiletries. Whether you are visiting Manila for business or pleasure, Hotel 99 Quiapo is there to provide you with quality accommodations set in a convenient location. Situated on the corner of Bautista and Hidalgo Streets in Quiap, Hotel 99 Quiapo is central... Whether you are visiting Manila for business or pleasure, Hotel 99 Quiapo is there to provide you with quality accommodations set in a convenient location. Situated on the corner of Bautista and Hidalgo Streets in Quiap, Hotel 99 Quiapo is centrally-located in one of Manila's well-known market districts. This businessman's hotel features an array of facilities and a friendly staff that tends to your needs during your stay. It is about 10 kilometers from Ninoy Aquino International Airport. Step into Hotel 99 Quiapo's 82 modern and well-appointed rooms that provide you solace from the city's hustle and bustle. Ease into a good night's sleep with the convenient amenities featured in each room, including air conditioning and an en suite toilet and bath equipped with hot and cold shower and bidet. Each room also has an LCD flat screen TV, telephone, towels, and basic toiletries. Room service can be ordered while housekeeping is provided daily at no extra charge. Wake-up calls can also be arranged at your request. Check-in time is Flexible. Hotel 99 Quiapo features a range of facilities to make your experience hassle-free. Safety is not an issue in the hotel as it is equipped with a 24-hour CCTV surveillance system and a fire alarm. The accommodation lets you go online with the free WiFi access provided in its public areas. Check-in time is Flexible. The market district of Quiapo is usually frequented by Catholic pilgrims visiting or attending mass at the Quiapo Church, which houses the statue of the Black Nazarene. In addition, the bustling district draws in shoppers looking to find bargain items. Earn as much as 84 points. deal stay option for Family Vacations, Couples and Solo Travellers. Additional facilities available in RedDoorz Plus @ EDSA Congressional are; Desk, Non Smoking Rooms, Room Service, Water Heater, Smoking Area, Spa, Salon, Restaurants, Car Parking Ar... deal stay option for Family Vacations, Couples and Solo Travellers. Additional facilities available in RedDoorz Plus @ EDSA Congressional are; Desk, Non Smoking Rooms, Room Service, Water Heater, Smoking Area, Spa, Salon, Restaurants, Car Parking Area, and 24 hours Front Desk. Enjoy comfortable yet inexpensive accommodations in Makati only at The Fort Budget Hotel - Bonifacio Global City. Located in the financial capital of Makati City, The Fort Budget Hotel - Bonifacio Global City is located along Kalayaan Avenue. Strate... Enjoy comfortable yet inexpensive accommodations in Makati only at The Fort Budget Hotel - Bonifacio Global City. Located in the financial capital of Makati City, The Fort Budget Hotel - Bonifacio Global City is located along Kalayaan Avenue. Strategically located just a few minutes from Bonifacio Global City (BGC), the lifestyle district of Taguig, the accommodation is about 20 minutes by car or cab ride from Ninoy Aquino International Airport. Guests are encouraged to inquire about the airport transfers offered by the hotel. Business travelers can benefit from its proximity to BGC and also the Makati Central Business District, which is only about 10 minutes away. The Fort Budget Hotel - Bonifacio Global City offers no frills accommodations. It boasts clean rooms that feature practical amenities for your comfort like air conditioning and free WiFi access. Rooms are kept clean with daily housekeeping. The hotel facilities parking spaces for guests, a business center, and a cafe. Travelers can relax and unwind at the rooftop terrace's lounge area. BGC presents a multitude of activities to try that will suit guests of all ages. Kid-friendly places to visit in this district include the theme park Kidzania Manila, play area Active Fun, Fully Booked, and The Mind Museum. BGC does not run out of dining options, with countless restaurants and fast food chains housed in the district. The numerous bars and clubs that line its streets also make it one of the ideal destinations to experience the famous nightlife in Metro Manila. Ervoruto is located in Manila, 2.3 km from Greenbelt Mall. Guests can enjoy the on-site bar. Some rooms feature a seating area to relax in after a busy day. You will find a kettle in the room. Ervoruto features free WiFi throughout the property. ... Ervoruto is located in Manila, 2.3 km from Greenbelt Mall. Guests can enjoy the on-site bar. The hostel also offers free use of bicycles. Century City is 2.3 km from Ervoruto, while Cultural Centre of the Philippines is 2.5 km away. The nearest airport is Manila International Airport, 7 km from Ervoruto. Priding itself as an "affordatel," Metro Deluxe Residences offers pocket-friendly, comfortable, and convenient accommodations that are near everything that Metro Manila has to offer. It is nice to know that there is a place where you can go to res... Priding itself as an "affordatel," Metro Deluxe Residences offers pocket-friendly, comfortable, and convenient accommodations that are near everything that Metro Manila has to offer. It is nice to know that there is a place where you can go to rest and unwind in the midst of the hustle and bustle of the metro. Metro Deluxe Residences' modern and stylish interiors give off a relaxing vibe that immediately takes away your worries and cares the moment you step inside its premises. It also has a friendly and helpful staff that ensures your needs and concerns are well-attended to. The hotel lobby is also an ideal spot where you can just sit back, enjoy a good show on the TV, browse the Internet, or even meet new acquaintances. Metro Deluxe Residences has 50 rooms in total, all of which are clean and simple in design. The hotel offers a wide range of room accommodations so whether you are alone or with a group, you will surely find a room that will perfectly suit your taste. The rooms also have their own private bathrooms, which come with shower facilities and toiletries. Metro Deluxe Residences is conveniently located along Santa Monica Street in Pasay City. It is just 15 minutes away by car from the Ninoy Aquino International Airport. The World Trade Center Manila is also just minutes away from the hotel as well as SM Mall of Asia, one of the largest malls in the Philippines. Earn as much as 68 points. Meaco Royal Hotel Tayuman is located in Manila City, that have well equipped facility to give guest satisfying stay. Since Metro Manila is a commercialized and progressive metropolis, it is easy to assume that the rates for hotels there are sky high. But it's also possible to find an affordable place to stay if you know where to look. For instance, hotels near tourist attractions or main roads tend to offer higher rates because of their advantageous location. So if you're on a strict budget, settle for hotels that are a bit out of the way but still accessible via public transport vehicles. Even if you don't have a car, it's very easy to get around Metro Manila because of the various and affordable modes of transportation available. City buses ply the metro's thoroughfares daily, as do jeepneys. There is also a train system that connects various cities. Depending on your destination, you can ride the MRT, LRT-1, LRT-2, and the PNR. Meanwhile, for short distances, you can ride a tricycle. Of course, you can expect to pay more if you want to travel with added convenience. There are also taxis all over the metropolitan and ride-sharing services like Grab and Uber. Another wise thing you can do to save more on your accommodations is to book months in advance prior to your visit. Before your trip, make sure to browse the rates for Metro Manila hotels on TravelBook.ph. There are numerous great deals for hotels in Manila in the website. Remember to sign up for a membership and subscribe to the newsletter in order to stay on top of the latest discounts and promos. TravelBook.ph also rewards you with points for every booking you make, which you can use to book hotels for your next trip. Do download as well the mobile app of TravelBook.ph for even lower prices on your chosen accommodation. While there is no specific peak season for tourists in Metro Manila, staycations are popular during holidays, weekends, and Valentine’s Days. Be on the lookout for promos for these days in order to save more money. A budget Metro Manila trip is possible as affordable places to stay are available year-round. Pocket-friendly lodgings range from budget hotels and inns to hostels and dorms so you'll definitely have lots to choose from. Private rooms at hotels come as cheap as PHP 1,000.00, while shared accommodations go for at least PHP 600.00. For your trip, you might want to check out Chillout Guesthouse, Leez Inn Manila, Hotel 2016 Manila, and Go Hotels Otis Manila in the City of Manila and Lokal Hostel, Z Hostel, MNL Boutique Hostel, and VIP Suite Hotel Makati in the City of Makati. These accommodations may be affordable, but most of them have convenient amenities like WiFi connections, parking spaces, and even in-house restaurants. Some of them even offer free breakfast. There are plenty of things to do in Metro Manila that are either affordable or free of charge. Make sure to do a lot of research online or ask your hotel receptionist where you can try these activities. Of Metro Manila's cities, Manila is the most popular among tourists since it is the country's capital. Visitors will find a lot of interesting sights like Intramuros, one of the most historic places in the country. On your trip there, make sure to check out Fort Santiago, the Manila Cathedral, San Agustin Church, Casa Manila, and Bahay Tsinoy to name a few. After your Intramuros tour, it's obligatory that you see the Rizal Monument at Luneta Park and the priceless artworks and artifacts at National Museum. Entrance to the museums are either free or have very minimal fees. End your day tour of Manila with a sunset stroll along Baywalk. Another city that tourists love to visit in Metro Manila is Makati. The Philippines's business district, its skyline is dotted with skyscrapers and is constantly abuzz with excitement because of its many attractions. Most people assume that Makati is an expensive destination, but little do they know, there are also plenty of things to see and do that won’t even cost a thing. The Ayala Triangle Gardens is one of the most popular parks in the city. You’ll find fitness buffs jogging or families walking along the paths of this peaceful spot in the heart of Makati. Other parks to check out include Washington SyCip Park and Jaime C. Velasquez Park. Quezon City is another popular city in the metro. Like Makati, its parks are also great places to spend the day if you're on a budget. Quezon City Memorial Circle is a favorite place for relaxation and recreation. You can ride a bike, see the Quezon Memorial Shrine, or play volleyball and badminton. Another great park is La Mesa Eco Park where you can bask in the nature surroundings while enjoying outdoor activities like swimming, biking, fishing, and even riding a zip-line. When it comes to affordable goods, Filipinos always turn to Divisoria. From clothes and accessories to toys and home decor, everything here is sold at pocket-friendly prices. If you're buying in bulk, you'll receive more discounts. And if you find the price of an item too steep for you, you can even haggle. Another popular shopping district is Greenhills Shopping Center in San Juan. This place also sells all kinds of goods under one roof, but it is mostly known for selling affordable gadgets. Greenhills is also the go-to place for people who want their broken electronics fixed like mobile phones and laptops. Fancy a food trip? Then head to Binondo, Manila's Chinatown. It has various dining establishment that each serves authentic and affordable Chinese food like dimsum, dumplings, noodles, and even hopia. Some of these eateries and restaurants have even been in business for decades already so you're assured of the quality of the food they serve. On your food crawl in Binondo, make sure to check out New Po Heng Lumpia House, Sincerity Restaurant, Shanghai Fried Siopao, Cafe Mezzanine, Wai Ying Fastfood, Masuki Mami House, Lan Zhou La Mien, and Tasty Dumplings. Food parks are also popular places to eat in Metro Manila and one of the pioneers is StrEat in Maginhawa Street, Quezon City. StrEat has a lot of great choices perfect for diners who want variety. Some of the popular joints here include The Soul Food Truck, The Lost Bread, Endless Summer Cafe, and Great Burger. Almost all of their specialties and bestselling items are priced at around PHP 100.00 or less.